← South America – Hockey in the Jungle? 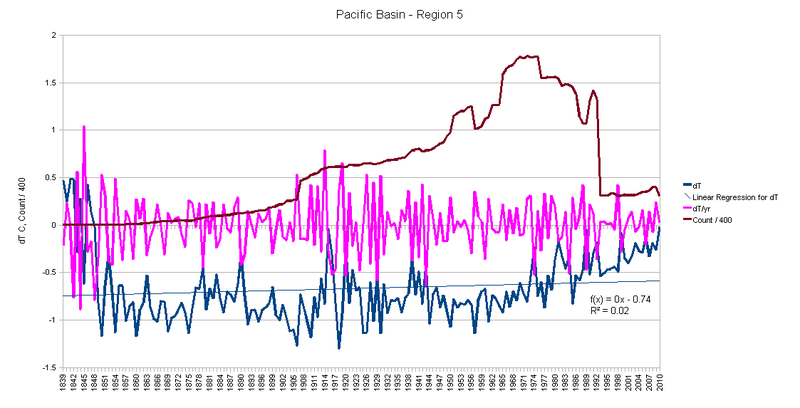 What I’m going to do is put up the graphs for a region, like the Pacific Basin, and then have follow on posting that link back to selected sets of the graphs for looking at particular issues. This will let folks who want to “cruise the graphs” do it fast, but also avoid turning a regional “graph rich posting” that is already large into a completely unwieldy giant thing. So this posting is “substantially complete”. There are one or two minor countries to add, but they often are just a reprise of one of the ones below. 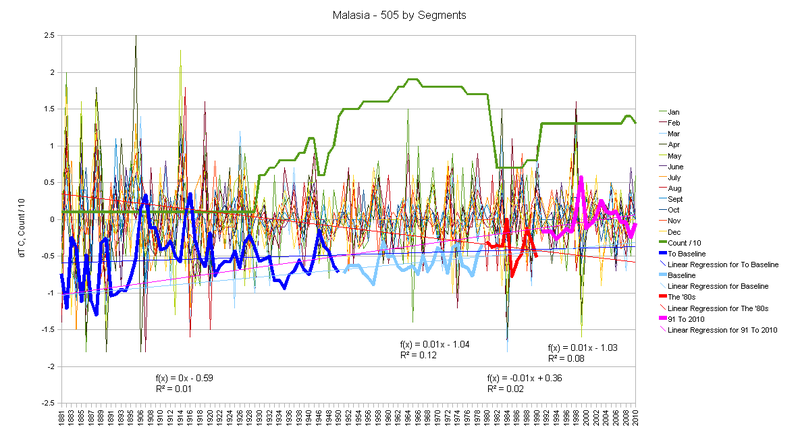 So a couple of “Singapore Hockey Sticks” and a couple of “Flats” and a few that are truncated (one has only 9 years data…). They will be added “for completion” as I’m looking for something to do with the hands while the brain works on contemplating another question ;-) They won’t add much to what you can ‘figure out’ by inspection of the charts that are here. 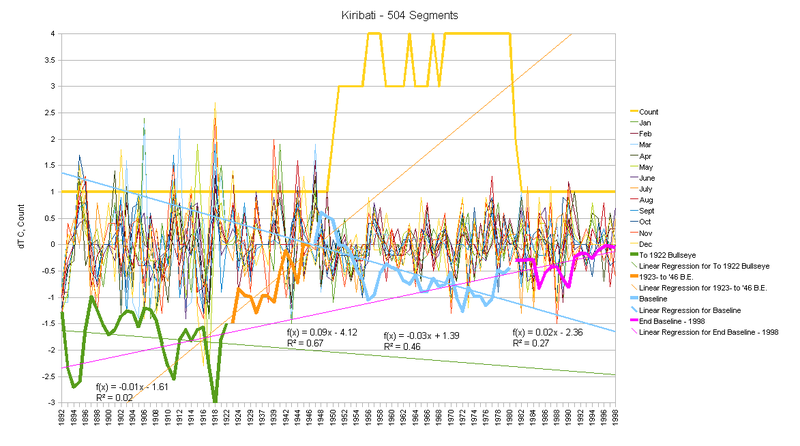 As an “issue” is observed, I’ll put up a “smaller bite” posting about that issue which will reference this archive of graphs. 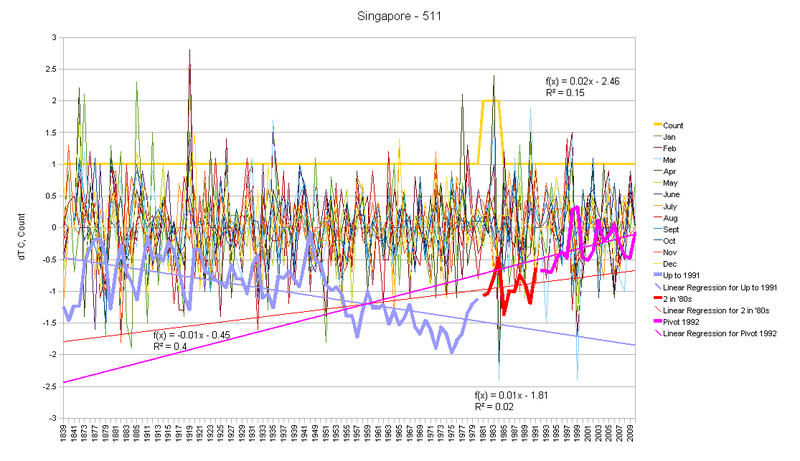 So, for example, you can expect at some point a Singapore Hockey Stick vs (something else nearby not a hockey stick) posting. Feel free to post comments here about anything you see in these graphs, but don’t be surprised if, over time, “issues” get covered in another posting as well. 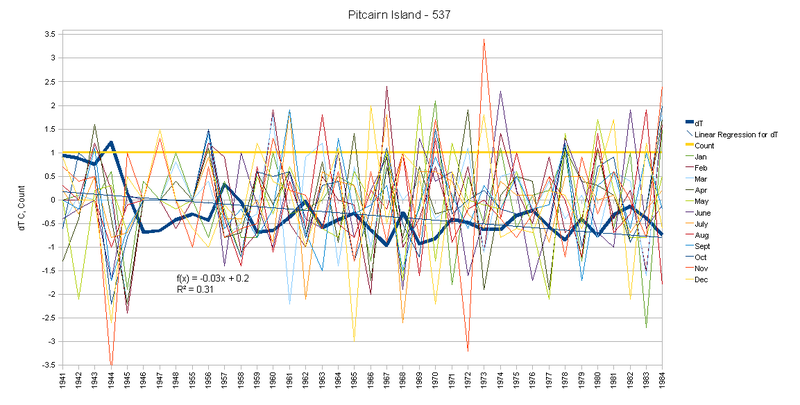 Here we have a nice sleepy Pacific, then we get a Hockey Stick right as The Great Dying of Thermometers happens. When we were looking at the raw temperature averages, there was not much going on in the average of the smaller islands, but there was a pretty good “warming signal” in Australia and New Zealand. We also saw a lot of change “by Latitude” and “by Altitude” and “by Airport Flag”. So how much you want to bet we find The Australian Hockey League? And maybe a B League in New Zealand? And a medium sized island further north? My God! The Pacific is Just On Fire!!! OK, what do you do when your stick is just got no blade? Splice on a new one! Notice when the thermometer count doubles? At that time the monthly anomaly volatility goes WAY down (as the pluses of one thermometer offset the minuses of the other), then when the cooling one ‘goes away’ we have The Reveal and, PRESTO! 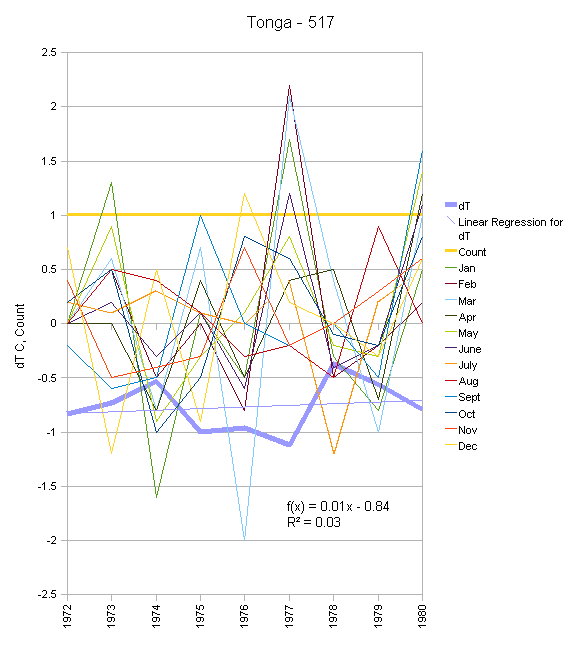 A Stellar Hockey Stick! 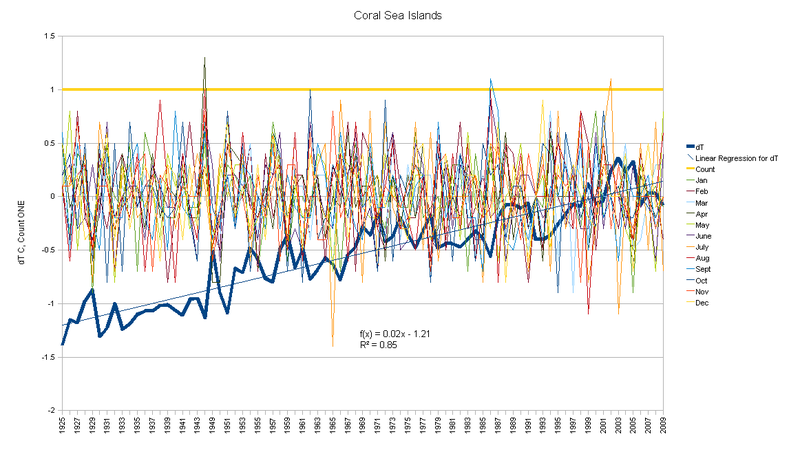 (Though even then we get a double dip in 1990 with the Magic Sauce that is fairly consistently applied to the data then. Just look at how clean and sharp the heel of that Pivot is! This is just fascinating. Look at how much the thermometer count changes. Bobbing and weaving all over the place. That first segment really ought to be divided into 2 or 3. Notice the later part of that first segment where it pivots down just at the start of the 1951 – 1980 GIStemp baseline period? Then a bit later we have something that I’ve seen as hints before. A 1970 era thermometer change (there is a hint of a ‘bullseye” where the monthly dT lines converge at near zero volatility in about 1970). This happens right when we get a small pop up as the baseline interval is coming to an end (but with a negative slope… can’t keep that for long). Then we have the 1980 Jump (with both some adds and some drops) followed by the 1990 ramp, but ending in more thermometer loss. French Polynesia (click for larger version). dT by month year/over-year. Hey Hey! Ho Ho! Cooling Islands Have To GO! Go FRANCE! Look at that dip. 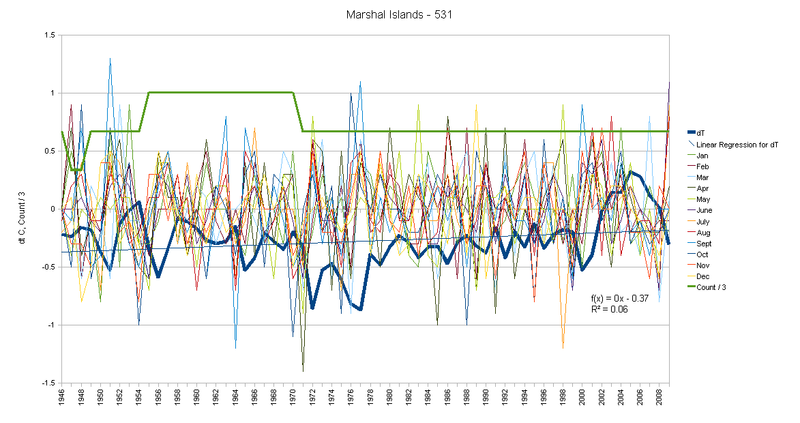 And even The French in New Caledonia can not resist forever… and get a 1 – 3 – 2 thermometer whammy. Starting with one, dropping, adding 2 to neutralize the drop, then removing one for a nice warming rise and a 1990 bit of a pivot. Now look at those two Agana Stations for just a moment. Gee, different…. OK, That’s about 3/5 ths of the global surface area between North & South America and the Pacific Basin. I’ve got to add some text to this posting (but the other two are mostly done with the additions of today), add the South Georgia Islands to the South America posting, fill in a couple of missing island groups in the Pacific Basin, and then go back to North America and add the Central American and Island countries that I was working on before I decided to “jump ahead” and knock out the South American and Pacific Basin sets. 1) It is “by country” and not a regional process nor a global one. 2) CO2 does not work “by country”. 3) The processes of “adjusting”, “in-fill” and “homogenizing” hide too many of the interesting bits. 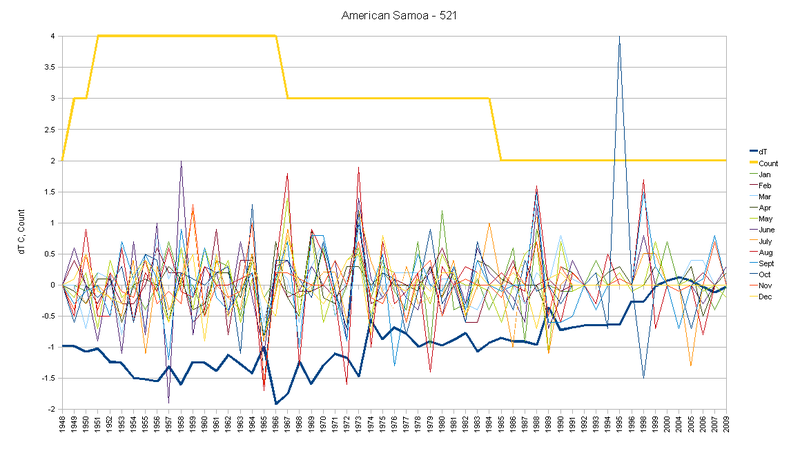 4) SOMETHING happened to the data in 1990. It is very important, it causes “warming”, and it isn’t CO2. It compresses peaks in both directions, but compresses cooling excursions more than warming. 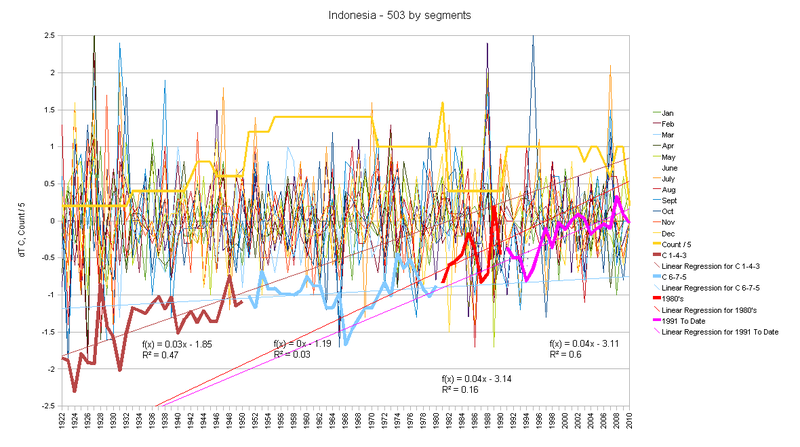 5) Lesser things happened in 1980 and 2006 (more or less) and can be seen in some countries more than others. 6) Thermometer Change Matters. It’s a bad idea to screw around with the instrumentation and change the thermometers in the middle of a calorimetry experiment. These country analyses are incredibly informative and interesting. I think the current lack of comments is because most people haven’t found your site yet, so some cross-posting would be good e.g. to WUWT, Climate Audit, Climate Depot. I’m in Ottawa Canada. I’m going to look into the Canada and Arctic data and your analysis some more to try to figure out what’s being done, why and by whom. Looks like widespread manipulation to me……. 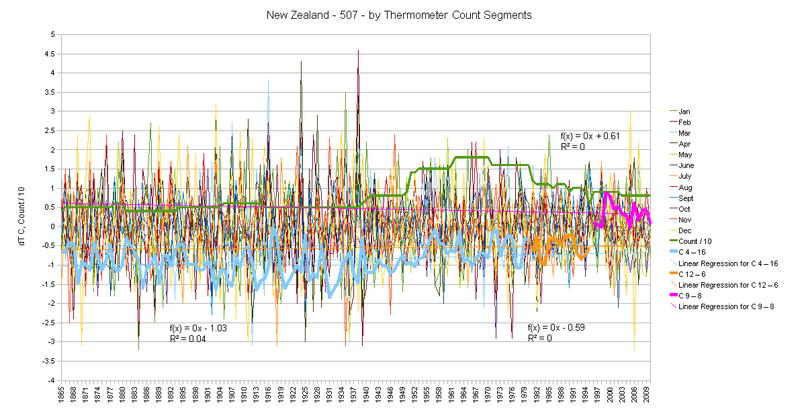 In the major countries when there has been sudden large dropouts of thermometers, do you see a consistent pattern or characteristics of the dropouts? Are they often the ones that are higher altitude or consistently cooler or something else? Europe, UK and particularly the other EEC countries would be interesting to see next as this is where much of the AGW hoax is supported. Thanks for all your outstanding efforts on this! 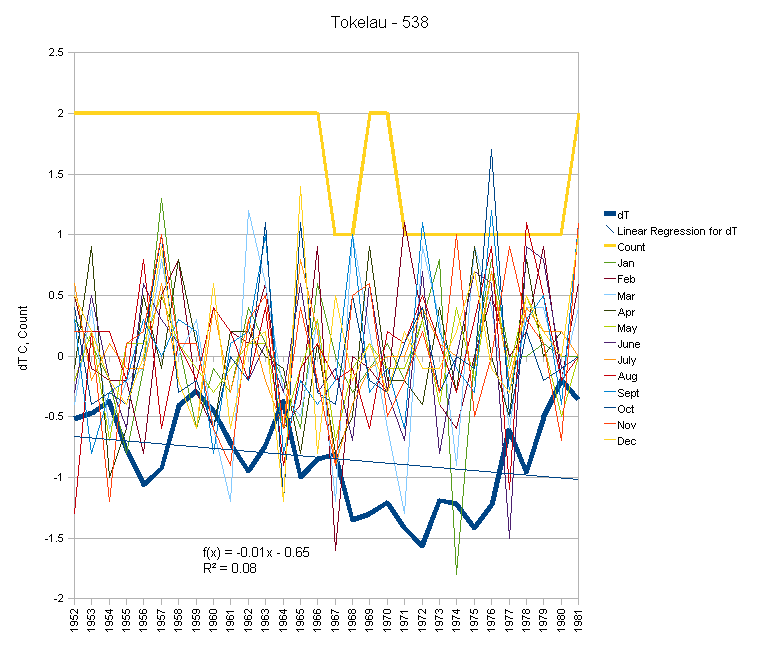 In (4) above you say “SOMETHING happened to the data in 1990”. 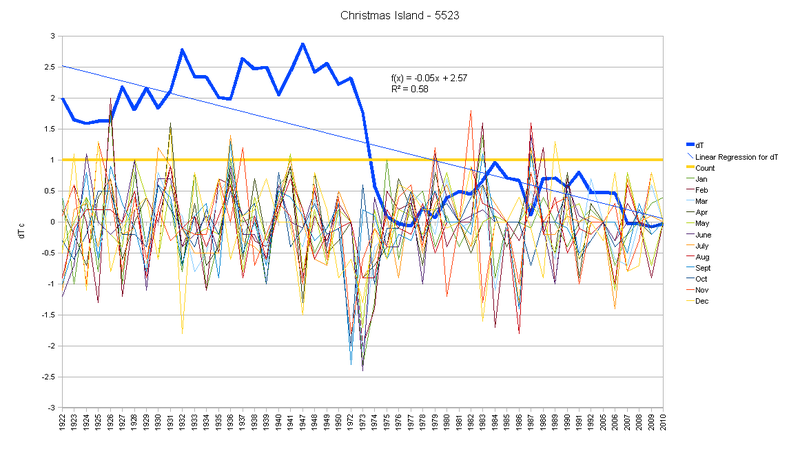 No doubt, we shall be told, that it was just a coincidence that the IPCC was set up in 1989. Nevertheless someone, somewhere arranged for the great dying of the thermometers. It seems to me a good possibility it was done under the auspices and (guidance?) of the IPCC. Sir John Houghton was i/c, with the backing of Margaret Thatcher, in those early days. Is this a case for more FOI requests? I joined a carpool, and am forced to listen to NPR two hours a day. 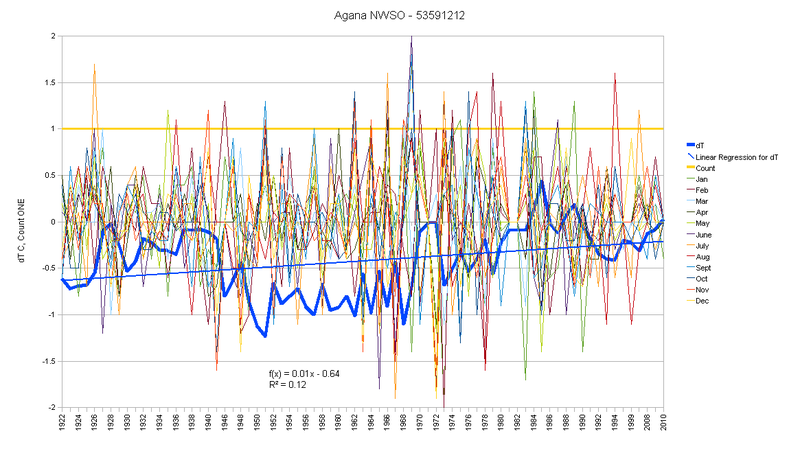 You would never know there was a wave of new thinking about AGW. There is still concensus in that world. The stories focus on what to do about it, not whether it exists. Folksy story about farmers suffering from falling carbon credit trades ran twice yesterday. The crash in that market was attributed entirely to fears of corrupt selling of duplicate shares – no mention of the recent exposure of CRU, failure in Copenhagen, and significant shift in poll numbers around belief or importance of AGW. I’ve been riding with the NPR gang for two months, and never heard mention of Phil Jones and CRU, or Mann under investigation. Its all pet political issues all the time. Sorry, just venting. I love the charts and analysis here. I have been lurking around your site for some time and find your work invaluable. While I am not a computer programmer, I have worked most of my career with large energy models, so I have experienced many long days trying to figure out why a model produces the results it does. Hence, I appreciate your focus “on the data” and on “exactly what the computer program (GISTemp) actually does” (rather than what it should do, or what people think the program does). 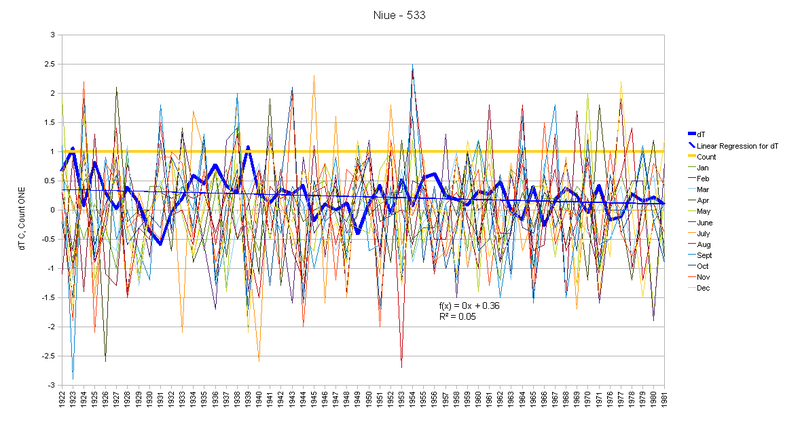 From my perspective, focusing on raw individual station temperature data allows one to see the original trends in the data without having to figure out whether the trends are being created by the underlying data or by the weighting and “adjustment” processes. 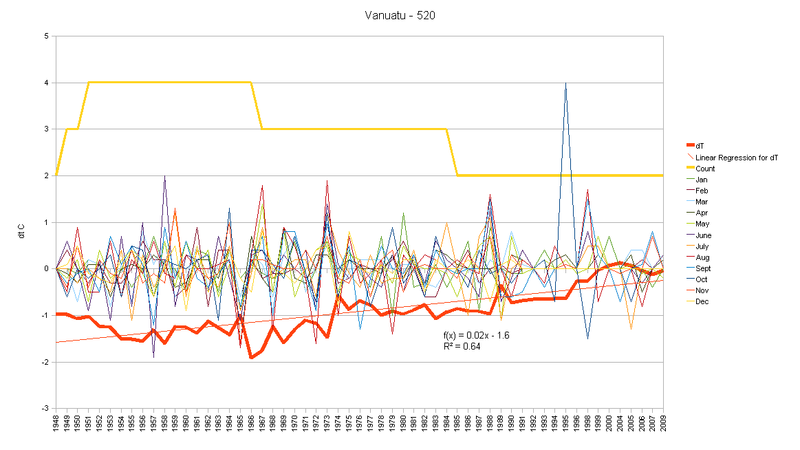 I am aware that these raw data may embody UHI and/or the impact of instrumentation changes, etc. However, by focusing on long-lived stations, one would hope to minimize biases and be able to observe the potential impacts of UHI over time. 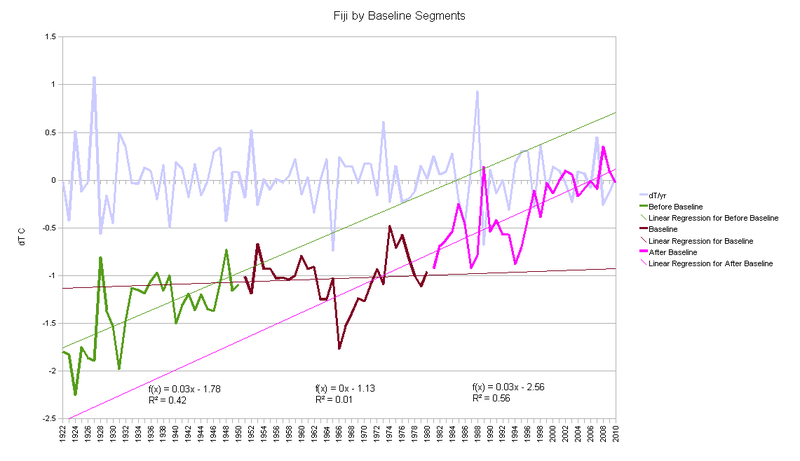 While individual long-lived station temperature data will not be “representative” of global trends, global trends must necessarily be rationalized with such data to be believable. that has some nice links in comments, IIRC. The answer may be in the Cru2010 files at the met office that they released after climate gate. I would just about bet my left nut that any months since then that exceed the SD would be dropped by “quality control “. 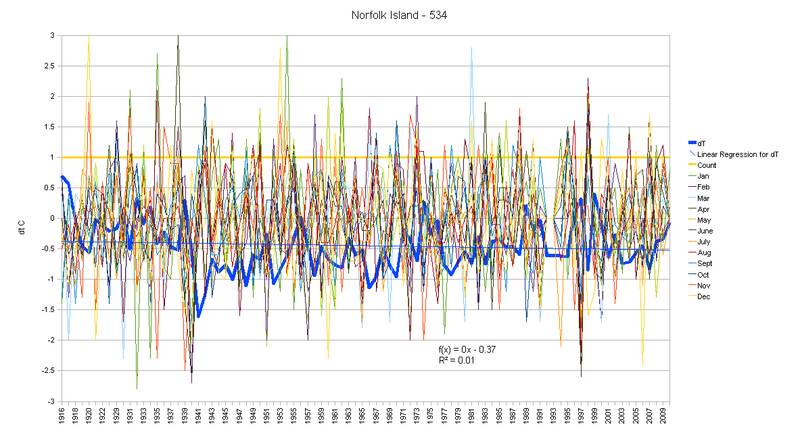 Note the “normals” are from a different period to the SD’s. There is some interesting stuff in there from Australia at least. 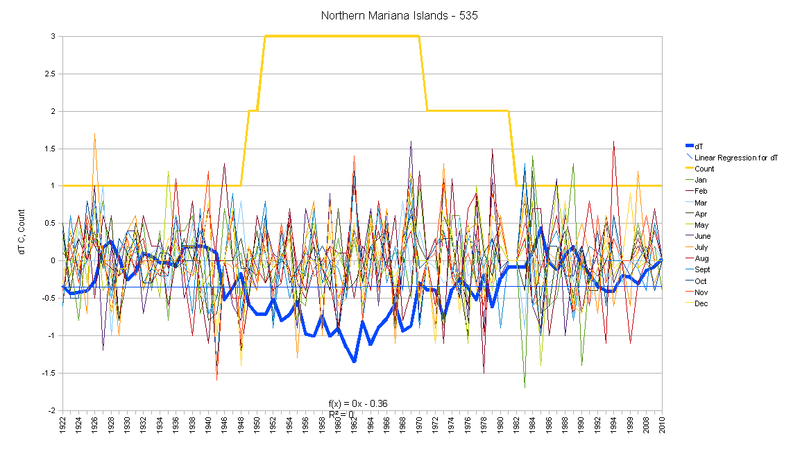 I have discovered that in a lot of cases these figures are actually higher in the early years than the pre Torak and Nichols adjusted Aust Bom data. It may pay to run those figures through your software and see what they say. There is an odd quirk in their behaviour that has been very useful to me (though I fear I’ve dampened that use lately). Typically if you have a weakness or oversight in an argument you will get slapped around about it. If you have a strong point, you get “dead air”. So I’ve used “complete silence and rising ‘hit rate'” as a 100% accurate indicator of “hot stuff”. Unfortunately, they recently (after I was on TV) had some folks assigned to badger me ( at least, that’s what it looked like – could have been ’emergent behaviour’ from individual actions). When I put a few of them in the SPAM filter, I started getting ‘Friendly Posting of links to people who think you are an idiot and your stuff stinks’ with a ‘have you seen this’ or a ‘thought you might want to know’. I let the first few through, as they were being polite, but when the pattern was clearly a 100% “hit” on every new posting within hours, often the first comment, well, those now go to the bit bucket too. I’m sure a few really were “concerned friends” but they were inextricably contaminated with the masquerading trolls. It’s kind of a Zen thing for me. I am but an empty vessel. I bring to the data some listening skills and an open mind devoid of preconceptions. If I’d found linear upward trends, that’s what would be in the graphs… but I found something else… and who I am or what I would like to find are just not relevant. For that matter, “liking” is really a mu! moment. I “like” being asleep. I “like” gin & tonic. What I “like” is just not relevant and so is not brought to the data. I most “enjoy” being that empty vessel and standing on the cusp for the first results of a new program run to come in. That is the moment of discovery (whatever it may bring… even a rising 45 degree rocket ride of heating – which would be truly an interesting find) and that moment can ONLY happen if you are at that moment “an empty vessel”. How can you have that tingle of anticipation hanging on the cusp of “discovery and change” if you already KNOW that you will find what you “wanted” to find? “Did you find what you were expecting?” is a MU! (The question is ill formed!) approach. I “expect” to find something unexpected, and that can only be done if you are “the empty vessel”… but I digress. So I basically shut down the ‘attack the messenger’ comments. And now they’ve all run away. Odd, really. If they can’t play “smear and insult” they don’t want to play? So this has made the “Silence is Golden” indicator less useful as they are now silent anyway. (It’s not me censoring. I clamped down on about 3 or 4 trollish folks for about a week, and then on the “friendly ‘idiot’ links” for about another week. Now ALL the AGW True Believers have just evaporated. Odd. Guess they can’t confine themselves to ‘the data and what they say’…) So now I only get 1/2 an indicator. The rising hit rate. It’s not something I spend a lot of time noticing, but it is something that’s basically not possible to avoid noticing. I do have to manage the comment queues. (For example, I’ve noticed that the Harvard IP address is the source of many of the AGW Troll postings… don’t know what it is about Harvard, but they did also provide a large number of “participants” for a show on the Looney Left Liberal “The Link” channel that was slamming the corporate form ( “The Corporation” was the title I think. Basically something you would expect to be straight out of the communist world of 1970’s but sprinkled with some Green Wash and a bit of “white Europeans are evil” reverse racism, though subtle, via the ‘oppressed people of color’ meme – ignoring that in many Latin American nations the oppressors are the same ethnicity as the oppressed.) And YES, I do watch shows from The Looney Left, just as I watch those from The Radical Right. It’s hard to know where the middle is if you don’t measure against the ends… But at the end of the day I see that the data says Harvard is highly biased to one end. It’s not ME saying that, it is them. Their IP address. Their participation on Link TV. etc. Love it, thanks so much for remembering us in the Sth Hemisphere. Its sad when all we get is the top half. 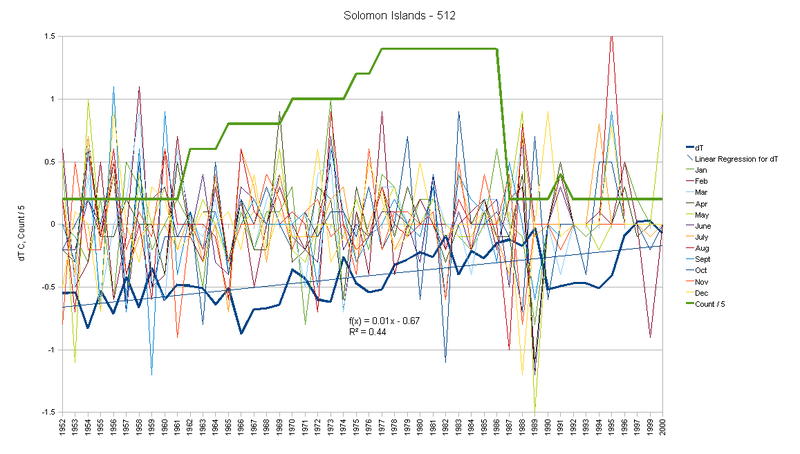 I found Bom graphs showing hotter in the early 1900s a few days later the page link changed and the data vanished! their excuse? housekeeping. yeah sweeping the TRUTH! under the Rug! REPLY:: [ Yeah, I ran into one of those. Had a link to a NOAA site that listed the data collection procedures and specifically stated that the observer could make up a missing value (i.e. guess) if needed. After a while it “dissapeared”. The fact that it was (and may still be for all I have found lately) “proper” procedure to just “guess” is now swept away… FWIW, having found that both Uruguay and Fiji have what look like rather manufactured “dips” in the baseline making “little dippers” and given that it’s just ODD for everywhere to have a ‘dip’ at the same time (notice the USA has a rise in 1934, other parts of the world not so much…) I’m wondering if the “dip” is made by selective listening skills applied to thermometers. So it would be VERY interesting to find records for places with a “Little Dipper” to either confirm or question the “Dip”. Especially Fiji as the nearby islands have very different profiles. I’d wanted to just filter out the “non-zero non-one non-two” Duplicate Numbers and figured there might be some 6 or 7 numbers but figured by 8 and certainly by 9 there would be two files with the same byte count as there would be no place that had been changed 10 times…. I was wrong. Comparing the rate of change of temperature for different periods of time with confidence intervals for the slopes doesn’t mean anything. If station drop out selected stations with an artificial bias towards warming (such as those with UHIs), then comparing the warming (with confidence intervals) at drop-out vs. non-drop-out stations before the great dropout would expose the bias. 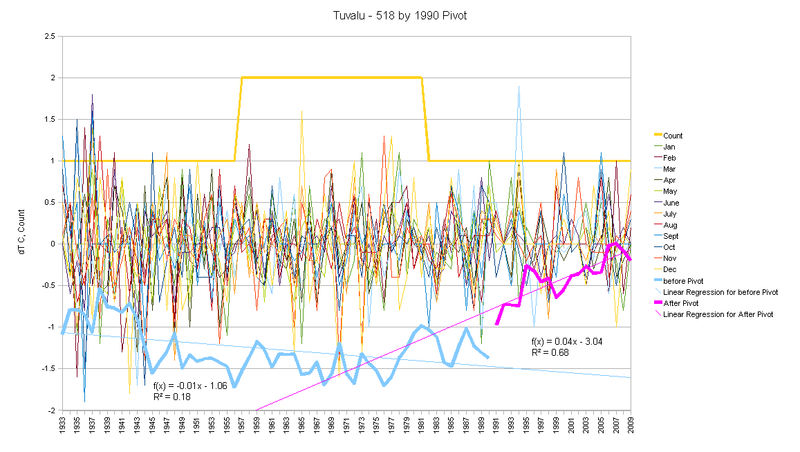 Re “Something happened to the data in 1990” and further to my posting on cooling in Tasmania from 1988 to 1992 at “Assume a Spherical Cow”. 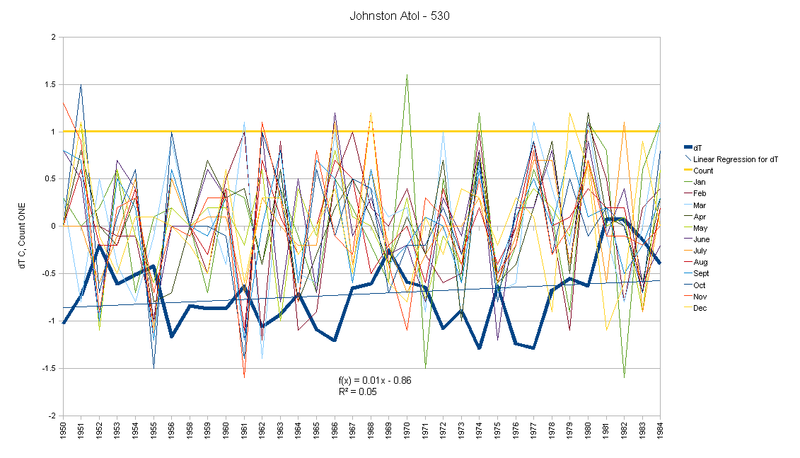 Cooling averaged approximately 1.24 degrees Celsius across all the 19 stations with continuous records. 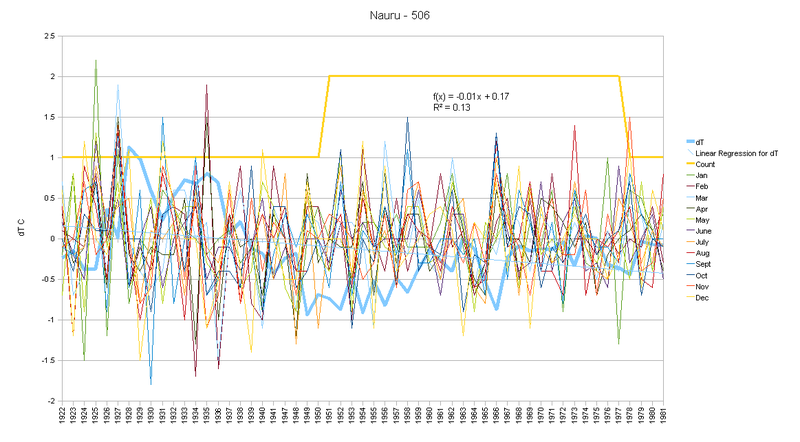 1985 had a low base temperature in Tasmania and rose steadily to a high in 1988 , the year James Hansen appeared before a US Senate Committee and made his catastrophic claims about AGW. 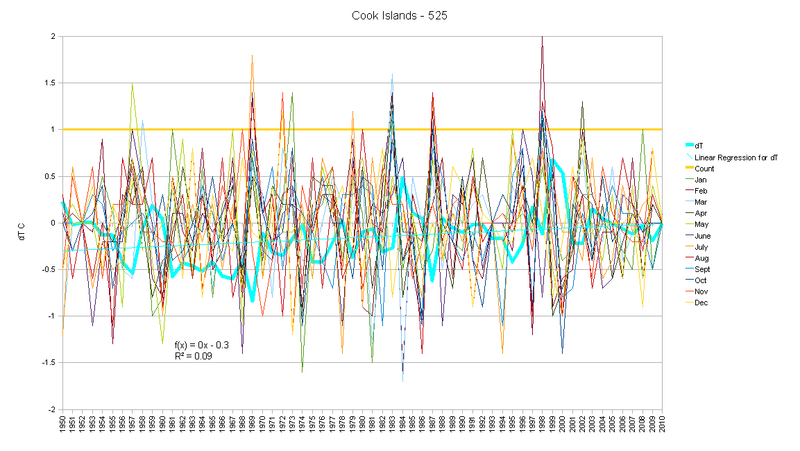 On checking many other Australian stations, four year cooling was evident at most of them. Chief, as you found out for me, in 1992 401 Australian thermometers “died”, leaving only 45 for the entire continent in 1993, the main of them at Airports. 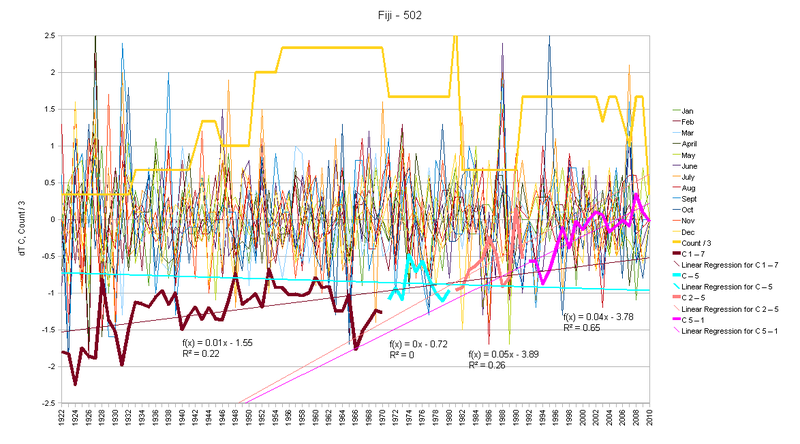 and found a ‘World Climate Report’ graph of Annual Global Temperature Departures 1979 -1999. This shows Surface, Satellite and Weather Balloon (radio sonde) Temperatures. 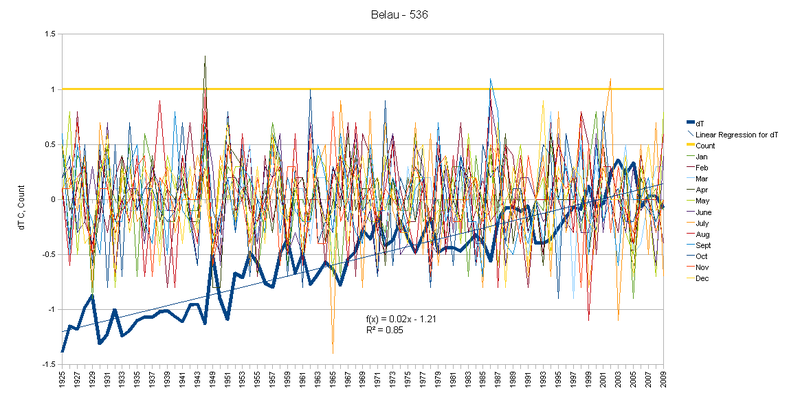 It seems there was a cooling everywhere at some time in that period 1988 to 1992. 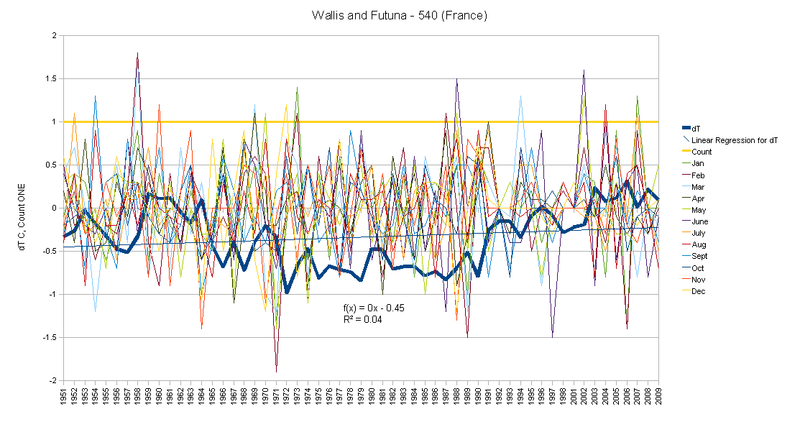 Between ’79 and ’91 there is not much divergence between the three records, almost matching in warming periods but the Surface record diverging more from the others when temperatures cooled. 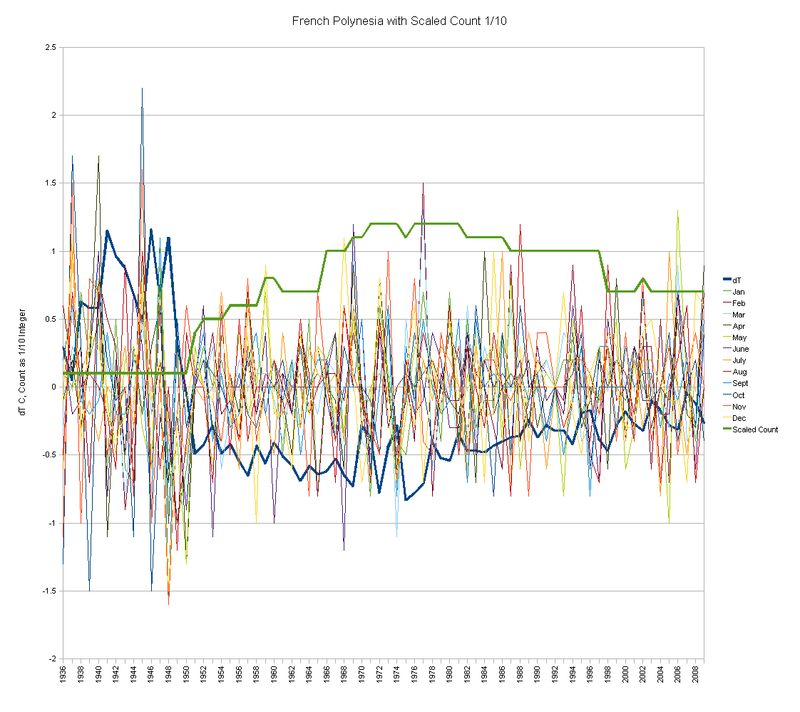 Between 1991 and 1992, the Satellite and Radio Sondes show a sharp cooling, with Surface stations showing less. 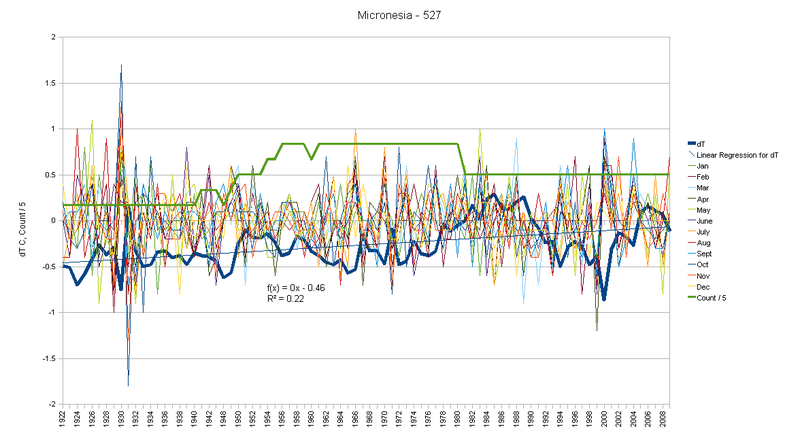 What is even more interesting is that the first sharp divergence between the three records appeared at that time and became entrenched until the El Nino year 1998 when the three records closely matched but then again diverged sharply the next year. 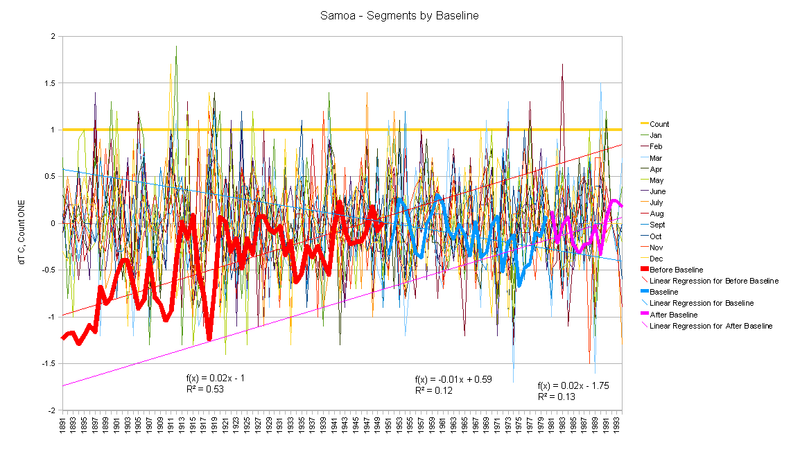 It is hard to ignore the link between Hansen’s predictions in his Senate appearance in 1988, the setting up of the IPCC in 1989, the apparent sharp cooling in 1990-1992, the Great Dying of Thermometers in 1992 and the divergence of the three records from then on. I got a chance to put up China yesterday: http://diggingintheclay.blogspot.com/2010/03/climate-syndrome-china-meltdown.html. I hope you don’t mind. Thanks for sending me the data. I still hope you’ll treat us to some hair graphs sometime. I like the trend analysis approach. I’m not set up for it, but it is a very intriguing thing… Which way was a station headed when it was added or dropped. Might I suggest Fiji as a candidate? It has a very complex set of adds/drops that look to be “trying” to make a “little dipper” in the baseline. 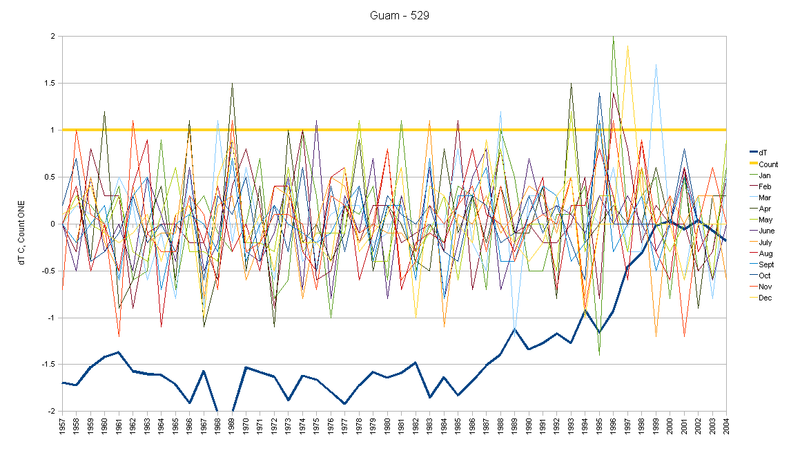 But without the trend data I’m just speculating. I only said “I hope you don’t mind” because having sent you my graphs I thought you might have planned to post them, but no harm in two different interpretations anyway. Yes blog time is a bit short at present, but please fire any data my way and I’ll queue it. If I don’t have time to write anything on it I’ll email the graphs back to you and you can add them here. Oh and sorry about the comments. I think quite a few people have problems. I have signed up with WordPress and Kevin has offered to host. Hope to move as soon as time permits. Er, no the China stuff you’ve already seen and replied to. But I’ve just sent a ‘useful’ (?) file just now. Some are similar. Many are dramatically different. There is no “one single trend”. 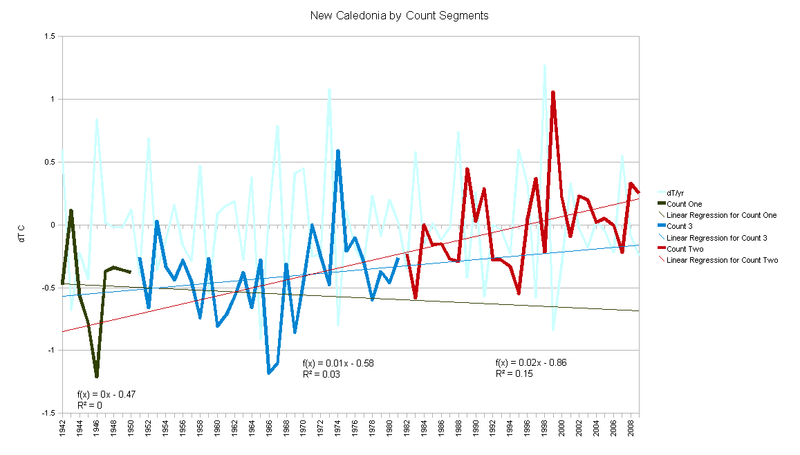 The Sharp cooling between 1991 and 1992 was the June 12th and June 14th/15th eruptions from Mt. 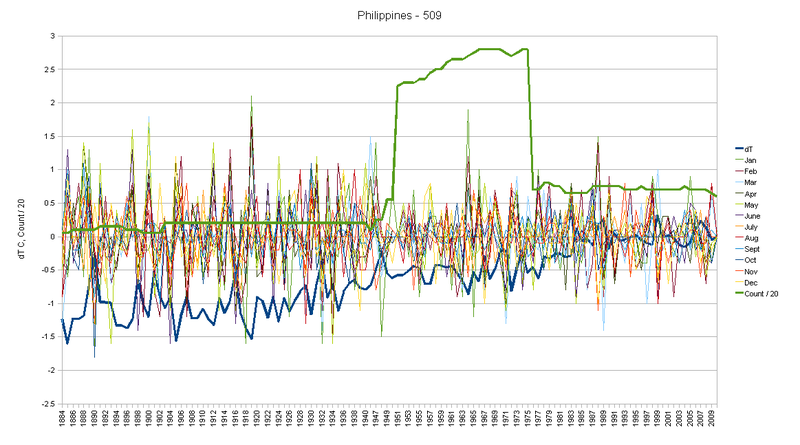 Pinatubo which dropped temps worldwide. I was in Subic Bay when that all happened and the eruption that started on June 14th blotted out the sun for an entire day. At high noon it was as dark as midnight outside.